The 2018 Infiniti QX80 Review: Infiniti’s gigantic, smooth-riding SUV, the QX80, gets a new look that makes it slightly less polarizing this year. 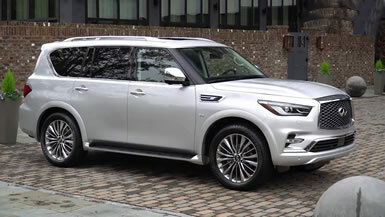 Long defined by its love-it-or-hate-it snub nose, Infiniti is hoping refreshed styling will move the QX80 into the “love” column for more buyers. The hood is longer and higher now, giving it a more upright, truck-like look, and its previously rotund curves have been replaced by gentle, sleek creases. Its overall look is more contemporary now. Still, you don’t have to look hard to see within those pretty new lines echoes of its close corporate relative, the Nissan Armada. And that raises the chief question about the biggest Infiniti: is it worth the premium over its Nissan cousin? If the Armada Platinum, priced at $59,190, weren’t such a competent product, the decision would be easier. With the similarly polished base QX80 priced at $64,750, and considerably more once you start adding content packages, it’s a tougher choice. Infiniti makes its case to keep buyers off the Nissan lot, not to mention Lincoln, Cadillac and GMC, with two key selling points: a premium feel and sumptuous cabin. Every time I drive a QX80 I’m struck by just how brilliantly it nails down how a luxury SUV should ride. It unapologetically isolates you from the road in the tradition of Rolls-Royce or the great American luxury barges of the past. It’s not trying to be sporty or thrilling. There’s no pretension of athleticism. Instead, there’s just silence. It really is one of the quietest, smoothest riding vehicles I’ve ever been in. Combine that with its chromed and creased body of heroic proportions, and it carries the aura that any good luxury car needs to stand out. Just as before, power comes from a gigantic V8 engine, something that gives me mixed feelings. On one hand, I can’t complain about the performance. Acceleration is brisk and effortless with 400 horsepower at your disposal, and towing capacity of 8,500 pounds means it can do a lot more than run errands around town. On the other hand, big V8s are going extinct for a reason. The QX80’s two-wheel-drive fuel economy ratings of 14 mpg in the city and 20 on the highway explain why many competitors are putting smaller, often turbocharged, engines in their full-size SUVs. For an over-the-top driving experience, though, it’s hard to beat the feeling of a rumbling eight cylinders under the hood of a supple, incredibly roomy, luxury machine like this. What was tested? The 2018 Infiniti QX80 4WD with a base price of $67,850. Options on the test vehicle: Deluxe technology package for $5,700, theater package for $2,450, 22-inch tire and wheel package for $2,800, driver assistance package for $2,900, cargo package for $225, roof rail cross bars for $400, illuminated kick plates for $465, WiFi for $450, and welcome lighting for $425. The total MSRP price as tested including the $995 destination charge came to: $84,660. The Bottom Line: The Massive Infiniti SUV QX80 gets a new look and is updated inside and out for 2018. Now the QX80’s distinctive nose looks more truck-like after a styling update, and its rounded body panels look more creased and athletic. Inside the QX80 has a hand-crafted look and feel, as it's cabin plays the upscale role to perfection. Soft, perforated and quilted leather on the seats, door panels and armrests give it the air of a hand-crafted English sedan, despite being a body-on-frame SUV built in Japan, with that country’s characteristic mechanical perfection. The refreshed cabin includes more storage space, including much-appreciated smartphone and tablet stowage in the center console. Why buy it? A new look inside and out is an important, contemporary update for one of the smoothest riding vehicles on the market today. And maybe, just for those reasons alone, you should “Drive one, Buy one, Today ©”.